Beacon Audio's Blazar offers wireless audio via Bluetooth in a sleek, compact package. Beacon Audio is a newer company in the audio game that strives to provide high-quality audio accessories for an affordable price. The company originally got off the ground via a KickStarter campaign that raised just over $323,000 by 1,769 backers. In today's review, we are going to take an in-depth look at their premium Blazar model that sells for $109. 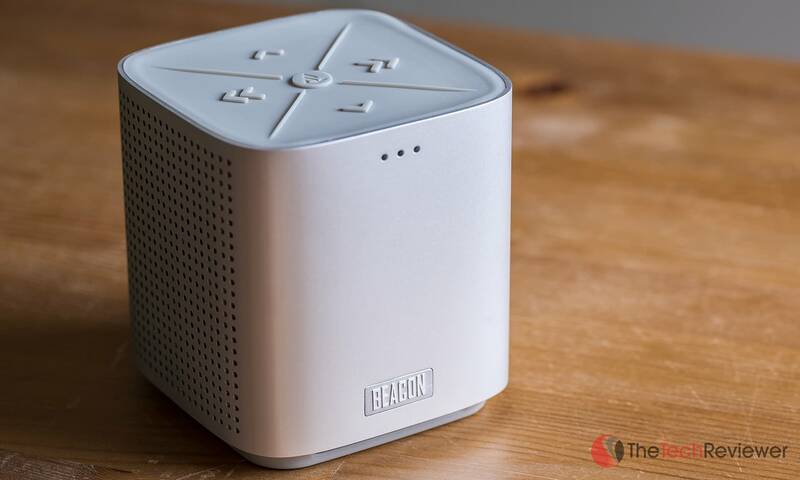 While I have never used any Beacon Audio products in the past, this product comes highly regarded via the current customer reviews on Amazon. In order to make this review possible, I was supplied with two samples of the Blazar, both in the brushed aluminum finish. Rest assured, all opinions expressed in the following article are based solely on my personal experiences with my review samples, and no outside influences or bias have had any effect on the outcome of this review. With a cube-like design, the Blazar is a visually appealing Bluetooth speaker that is small enough to store in a bag or purse while on the go. The chassis is made up of a single piece of aluminum that stretches seamlessly around the exterior of the unit and has chamfered edges, so there are no sharp corners. If you have an Apple computer model with an aluminum finish, this will be a near perfect match. 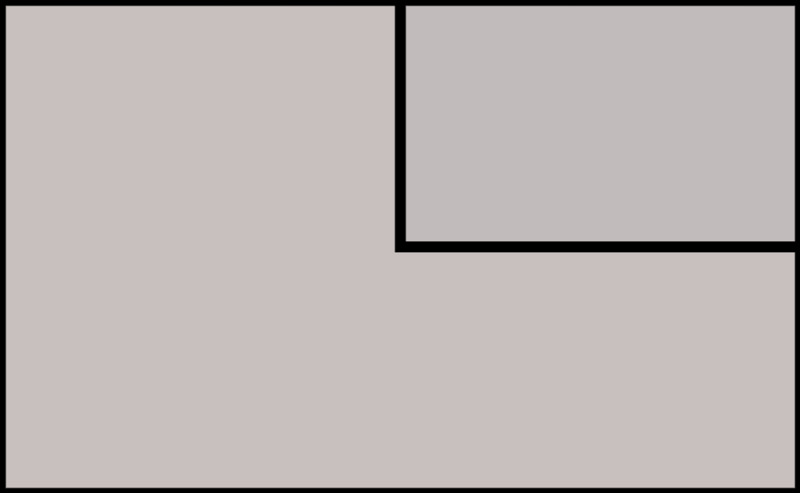 The front sports a small Beacon logo and three holes above it which house the integrated microphone. 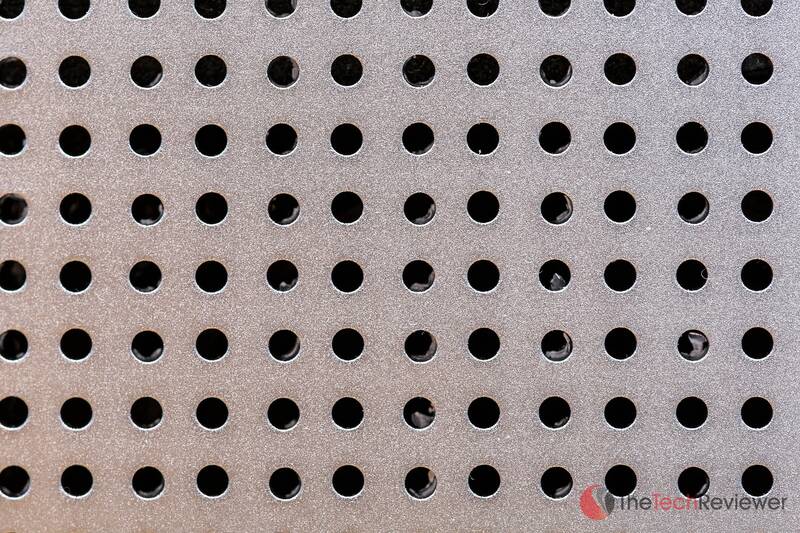 Moving to the left and right sides of the device, there is an assortment of holes drilled into the aluminum for sound distribution purposes. These holes are equidistant from one another although, upon close inspection, there are some small manufacturing defects resulting in excess aluminum scraps of which still remain visible inside these holes. On the rear, you will find the on/off switch, a micro-USB charging port, a 3.5mm audio in/out, and a “share” button used for stereo pairing (I'll get into this in the next section). On one of my samples, the share button is tactile and snappy yet the other has a mushy, unappealing feel to it. Below these components, there are two holes with LEDs inside which are used to communicate with the user. 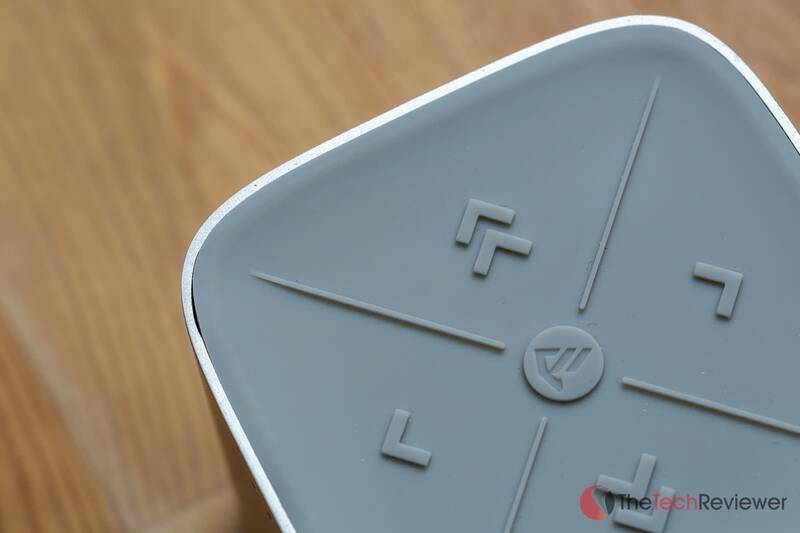 The top of the speaker features a rubberized coating with button controls for your standard play/pause, skip, back, volume up and volume down. 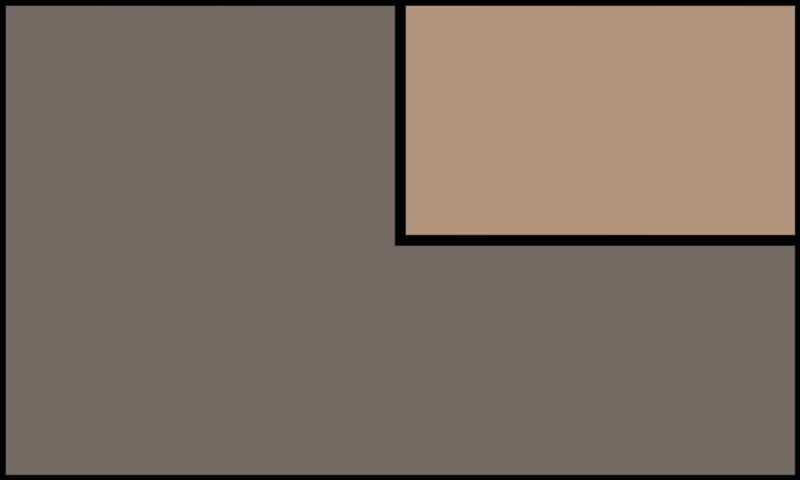 Holding down the middle play/pause button is also how you initiate the Bluetooth pairing mode. Once again, this is an area where small manufacturing defects are visible on both of my samples with the rubber coating having some irregularity in regards to it sitting flush against the chassis. With every Blazar comes a leather carrying case (I presume it is faux) as well as Beacon branded micro USB and 3.5mm cables. Since there is no included USB to AC adapter, you'll need to rely on a spare or use an open USB port for charging. This is less than ideal for most and surprising to now see one included at its $110 price-point. Internally, the Beacon is powered by two 50mm titanium core drivers and a 60mm passive radiator bass driver. For wireless audio playback, there is integrated Bluetooth 2.1 EDR chipset that supports virtually any modern smartphone or tablet. If you are lacking a Bluetooth-supported device or only want to utilize these speakers the “old fashioned” way, you can always use the supplied 3.5mm cable for a more reliable, hard-wired connection. 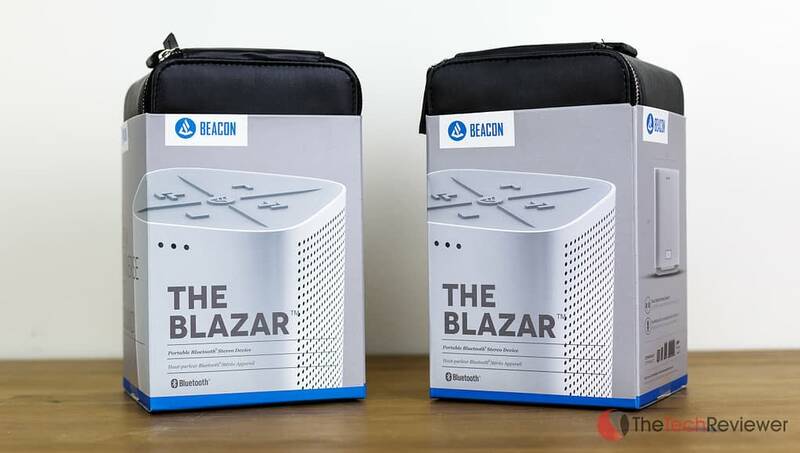 According to the Beacon Audio website, the Blazar features an integrated microphone for 2-way hands-free calling when paired with a compatible device. Android users will also benefit from support for NFC, which should simplify the pairing process a bit. Like many of its competitors, the Blazar relies on an integrated rechargeable battery for powering the device. While you will save on buying disposable batteries, the 10-12 hour battery life may become an issue in scenarios like camping or traveling where you may be without access to a dedicated power source for extended periods. One of the largest differences in regards to the Blazar of its competitors is the support for wireless stereo pairing when you have two Blazar models within range. While this requires the a higher operating cost due to the need to purchase of two devices (sold bundled for $210), it is a rather unique feature that sets it apart from competitors at this price-point. I've been using my set of Blazar speakers on a daily basis for the past three weeks or so while working and relaxing around my house. One of my favorite things about the Blazar is its compact size thus making it easy enough to throw in my backpack when on the go or when traveling. The Blazar is light enough to lug around without issue yet it still feels substantial and well-built in my hand. The included USB and 3.5mm cables are appealing and well-made, but I'd like to have seen a USB to AC adapter included in the package for convenience. 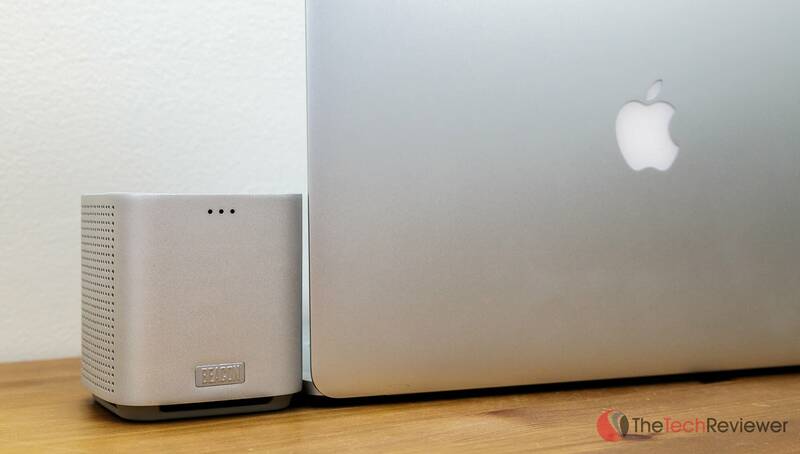 I am a big fan of the aluminum finish as it looks great next to my Retina MacBook Pro and some even mistake for Apple-branded speakers at quick glance. The lack of decent instructions made the Bluetooth syncing process a bit more complicated than I expected, but soon enough I had my iPhone 6 Plus connected and pumping out some tunes. For the record, you can put the Blazar into “discover” mode by just holding down the middle Beacon Audio icon on the top of the Blazar until it beeps and the back LED flash red and blue continuously. Discovering and connecting to the Blazar's Bluetooth signal was straightforward on my iPhone 6 Plus, Nexus 5, and iPad Air although I was unable to find it on Macbook Pro regardless of some extensive troubleshooting. Eventually, I updated to the newest Mac OS X Yosemite update, and it allowed me to discover both units without issue. For the record, when using a pair of Blazars in “stereo” mode, you simply connect to one via the Bluetooth menu on your device and press the “share button” which will then “link” the two Blazars together (you'll head some beeping as they sync). So technically you only connect your smartphone, tablet, or computer to one of the units and then the other Blazar hooks to the original source unit by way of Bluetooth. 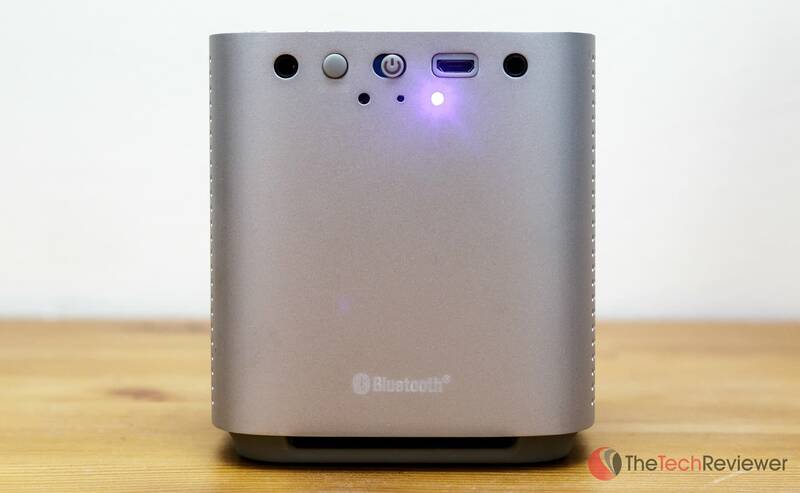 With small form factor of the Blazar, the audio performance is surprisingly good. It is important to remember this is a $110 Bluetooth speaker so you cannot expect a premium audio experience like you'd get with an expensive set of professional speakers. The highs are reasonably crisp although I did find the mids to be a bit muddy for my preference. Like many consumer's speakers nowadays, the lows (bass) are a bit overpowering which is suitable for rap and R&B tracks although less ideal for more laid-back genres. Battery life is relatively decent, can easily get hours of playback without needing to plug in. However, I often forget to turn them off since the on/off switch is so small and hidden. The maximum volume is fairly high (higher than my iPhone 6 Plus's integrated speaker) although nothing too powerful. I can listen to one or both in stereo mode at full volume without it being too much for my ears (this may mean they are not ideal for use in loud social gathers with a lot of background noise). From my experience, I prefer sound better with one rather than the two in stereo mode. While doubling the sound potential with two simultaneously distributing your sound in a left and right channel, the quality seems to deteriorate slightly. Beyond this, the stability of the connection in Stereo mode via Bluetooth is also an issue. 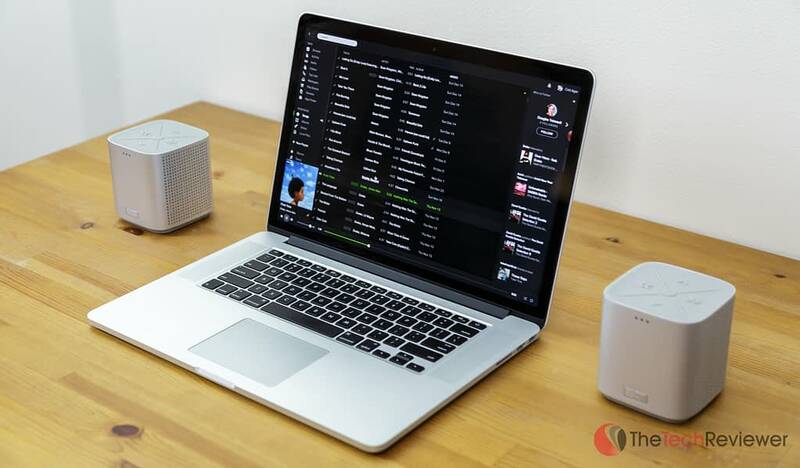 There can be a fair amount of stuttering and pausing if you are wirelessly streaming audio to the pair should your Bluetooth source be moving. For example, the connection is less reliable if my phone is transmitting the signal while in my pocket and I walk from room to room in my house. With only a single Blazar utilizing the signal, the range and reliability seem to get a significant boost. Handsfree calling is hit or miss. It doesn't always give me the option to use the Blazar as a microphone/speaker when a call comes in. When it does utilize the speaker, the quality on my end sounded mediocre although my recipients did say I sounded clearer than my standard iPhone 6 Plus's speaker with “less echo”. For the best sound quality and performance, you can use the supplied 3.5mm cables to go from your audio source to the f1st Blazar then use the audio out on that same Blazar to plug into the audio in on the 2nd Blazar. 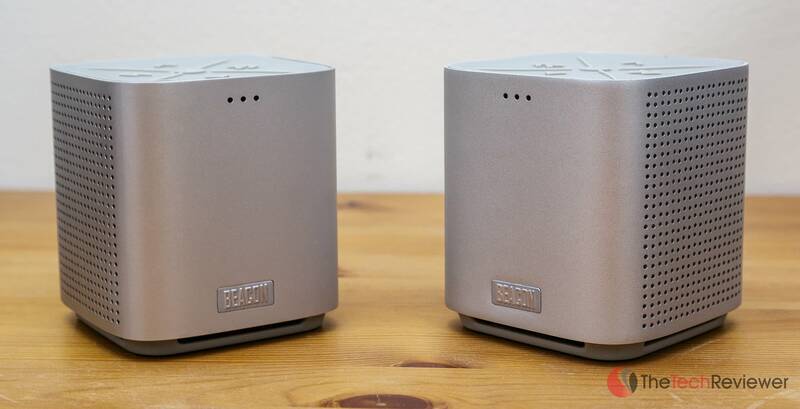 The Blazar by Beacon Audio is a decent speaker for the price, packed within a sleek and portable form-factor. If you are in the market for a single Blazar unit, I would recommend it as long as you value looks and size more than actual sound quality. I would also suggest taking a look at the JBL Flip 2 as it offers comparable sound quality and features at a slightly lower price-point. Should you be interested in the Blazar based on its stereo Bluetooth benefits then it becomes a bit more complicated. If you NEED the wireless stereo functionality, then the $210 price-point may be warranted in your case. However, at $210 (plus tax and shipping) I would rather spend my money on a more high-end speaker set even if it means giving up the Bluetooth functionality. Another option to consider is Griffin's Twenty Digital Audio Amplifier, an accessory that allows you to connect traditional speakers to gain Bluetooth connectivity.